Twin Power belts have teeth on both sides to provide synchronization from both driving surfaces. PowerGrip Twin Power Timing belts are suitable for all industrial serpentine applications requiring rotation reversal in some driven shafts. Gates Twin Power belts have nylon facing on both tooth surfaces providing equal load carrying capabilities on either side of belt. 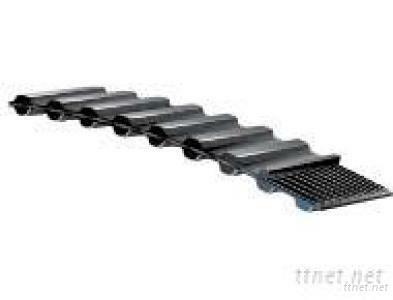 Belt capacity is equal to standard single-sided PowerGrip Timing belts. Quieter than roller chain drives and eliminates lubrication and re-tensioning to reduce maintenance and labor. Gates PowerGrip Twin Power Timing belt part numbers are comprised of pitch length, pitch and width. TP denotes Twin Power. Length-The length is shown in the first part of the belt designation. The first number is the pitch length in tenths of an inch. A TP300L075 has a 30.0' pitch length. H = Heavy = 0.500' pitch. Width-The width is shown in the last part of the belt designation. Part number TP300L075 is. 75' wide.